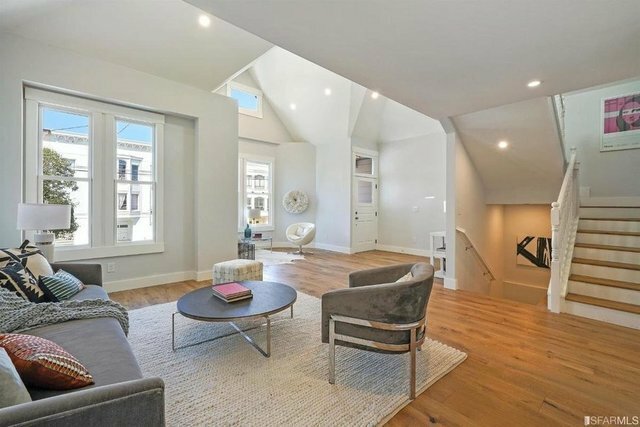 Behind an exquisite Edwardian facade is this expanded, completely reimagined 3-bed, 3.5-bath home. Bright main floor features formal living room w/cathedral ceiling, open chef's kitchen with eat-in waterfall island, quartz countertops, Thermador appliances, sizable dining area, spacious den w/access to inviting 2-level landscaped backyard plus powder room. Upstairs master bedroom w/ large shower + private deck. Lowest floor features another en-suite w/direct access to back patio, 2 closets, large soaking tub + shower. Large bedroom, flex room, another full bath, laundry room w/hook-ups, access to garage + parking pad complete lower level. Oak floors, Porcelanosa tile, Hansgrohe faucets, new windows/doors, new roof.